These Kazakh corpse gods of Thrash Metal take no prisoners in their quest for extreme music, infecting us all and spilling our blood into the circle pit to the sound of their new pulverizing album. Formed in 2010 in the city of Almaty, Kazakhstan’s largest metropolis set in the foothills of the Trans-Ili Alatau mountains, Kazakhstan Thrash Metal maniacs Zarraza have just released their long-awaited debut album Necroshiva, following up to the band’s 2013 EP Cutting Meat. Fast & Loud. And one of the hardest working metal bands in Central Asia, having already played in Uzbekistan, Kyrgyzstan and Kazakhstan, takes no prisoners in their quest for extreme music, with each of the eight groovy and pulverizing songs in Necroshiva crushing your minds mercilessly like a runaway train of evil. 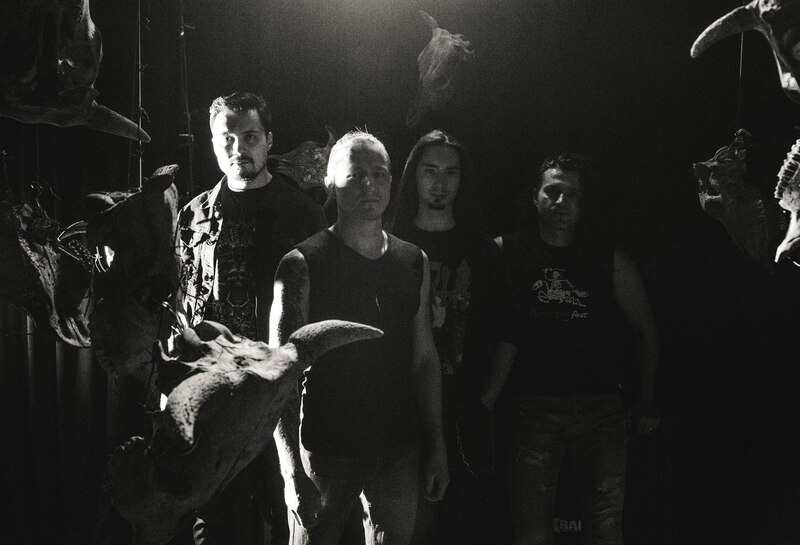 Comprised of Nick Khalabuzar on vocals and guitar, Alex Filatoff on bass and Ruslan Konon on drums, Zarraza’s only concern in Necroshiva is how their lyrics would be translated into Kazakh or Russian. “Anti-religious songs full of sarcasm and quotes from Giordano Bruno and Pierre-Simon de Laplace are not welcomed in a country where there is a significant Muslim population,” said the band, but that seems to be only a minor issue for them in the end. Displaying a beyond devilish and somber cover artwork by Russian artist V. Smerdulak (Katalepsy, Melancholy, Semargl, Arkona), Necroshiva is everything we love in Thrash and Groove Metal, being highly recommended for all mandatory thrashing activities such as slamming into the pit, headbanging like a beast and raising your horns to the band’s infuriated music. Abyss Above Me kicks off the album with an explosion of brutal and austere Thrash Metal, a fantastic welcome card by this Kazakh squad led by the demented drumming by Ruslan and the raspy, choleric vocals by Nick, bringing elements from Groove, Death and Black Metal, and their furious onrush of extreme music goes on in the also belligerent Shadows, with Nick sounding bestial with both his growls and riffs, while Alex adds tons of groove to the musicality with his rumbling bass. Then we have the title-track Necroshiva, an insanely demolishing display of Thrash Metal with a strong progressive vein, where Ruslan is even more impressive with his intricate beats and fills and its modern-day lyrics go along extremely well with the music (“War’s for gods… Slaughter of lambs / It’s hecatomb we made for thousand years / Immortal rites of human sacrifice / Transformed into modern way of life”); followed by another complex and infuriated tune titled More Than Hate, an almost-Death Metal creation by the quartet led by Nick’s spot-on riffs and solos, with the level of adrenaline being exactly what you need to crush your skull into the circle pit. Dark waves permeate the air in the melancholic and apocalyptic bridge Echo Of The Future, setting the stage for the modernized thrashing feast named Dead Star, displaying hints of Scandinavian Melodic Death Metal the likes of Arch Enemy and the early days of In Flames. Furthermore, Nick managed to sound even more boisterous on vocals, as well as the metallic bass lines by Alex which will punch you in the head mercilessly. After such beautiful exhibit of extreme music, get ready for a Progressive Thrash Metal voyage in Voice Of The Forgotten, with the music flowing in some sort of demonic Dream Theater-ish mode, but of course with Nick bringing rage to the sound with his roars, all spiced up by some electrifying guitar solos. And ending the album on a high and violent note we have 150 Words, with its lyrics reeking of malignancy (“Serpent – you crawled inside my world / To steal – affections of my soul / To brew your bile words of hate / And sting me in back to weaken / Your only way to live is betrayal / Soaking dirt to digest”). Musically speaking, it’s a frantic, violent Thrash and Death Metal attack by Zarraza, leaving us eager for more of their devastating music. I’m not sure if you have already realized you’re in front of a metal band from the distant land of Kazakhstan playing top-notch Thrash and Groove Metal that only the finest bands from the United States, the land of thrash, are capable of reproducing, which means you should definitely show your total support to Zarraza by buying Necroshiva (available for a full listen on Spotify) from their own BandCamp page, CD Baby, iTunes or Amazon, and by following them on Facebook, VKontakte and YouTube. The corpse gods from Kazakhstan are among us to stay, and you better be prepared to spill your blood into the pit in the name of Thrash Metal. Best moments of the album: Abyss Above Me, Necroshiva and Dead Star. This entry was posted in 2018 New Releases and tagged abyss above me, alex filatoff, Almaty, black metal, dead star, death metal, evgen hablack, groove metal, kazakhstan, melodic death metal, necroshiva, nick khalabuzar, progressive thrash metal, ruslan konon, shadows, thrash metal, v. smerdulak, zarraza by Gustavo Scuderi. Bookmark the permalink. Pingback: All you should know about “Necroshiva”: reviews from MetalSucks, AngryMetalGuy etc.